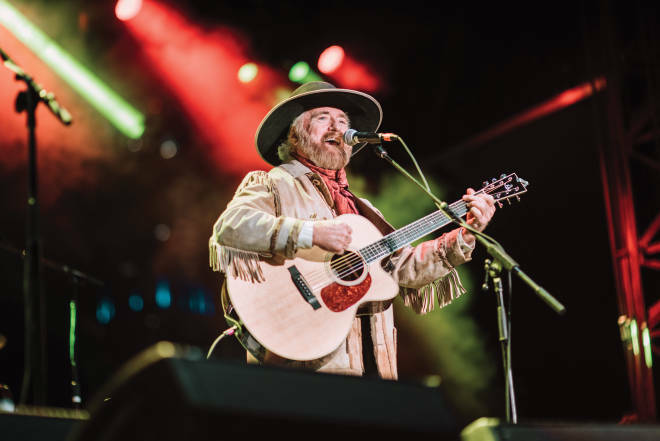 Country star Michael Martin Murphey brings the party to Red River. In an interview with New Mexico Magazine, he talks about why he loves this state. American WestFest returns to Red River July 4–8 for a five-day series of performances at Brandenburg Park and the Red River Conference Center. Country Music Hall of Famer Michael Martin Murphey first organized the festival in 1986 as a celebration of the music and culture of the West. Murphey, who earned fame with hits such as “Wildfire” and “Carolina in the Pines,” is scheduled to perform with the Rio Grande Band on Friday and Saturday (michaelmartinmurphey.com). We recently caught up with “Murph” on the road and asked him about the evolution of the festival. It’s been more than 30 years since the first WestFest. How has it changed? MMM: It focuses more on mixing the latest wave of Native American performing artists and new Western music singer-songwriters. And my sons and daughters are getting more involved now that they are experienced performers. The shows are now like a multigenerational family reunion. Thirty years ago, there were no awards or charts for our performers—just pop and country. But now we have Americana, Western music, Native American singer-songwriter, and bluegrass charts, and awards to track their success and draw crowds. Is there one performer at WestFest that you’re particularly excited about? MMM: Native American performing artist Gareth Laffely is still in his teens, but he’s producing masterful pieces of music that stir up the heart and soul of Native American spirit. He’s a prodigy bound for international stardom. He’s the youngest artist in history to achieve number two on the Billboard New Age charts. What is a perfect summer day in New Mexico for you? MMM: I love to get on horseback and ride the high deserts and mountain meadows of New Mexico under a turquoise sky as storms build into afternoon rains and rainbow sunsets. The mixed scents of sagebrush, pine, meadow grasses, wildflowers, and campfire smoke as you cook a cowboy meal of coffee, biscuits, beans, and beef—that makes my day. In sunshine or rain, there’s nothing like riding a good pony over the old trails of the ancient ones, mountain men, pioneers, and cowboys.